And life just got a little easier. 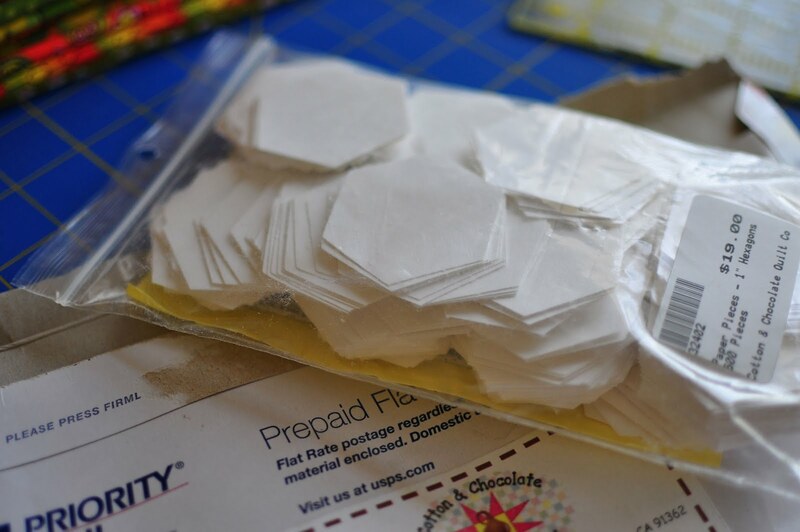 I often frequent Cotton and Chocolate for my supply of paper hexagons too LOL , my printer does not work and I have used my old books to cut them up all up as well. I had to re do mine because I was not accurate !!! nice! i haven't bought any yet... but I think I will soon :-) Is that 300 paper pieces? Lets see.... I can print 6 hexies per page - and it takes me probably 3-4 minutes to cut out each page of 6... so I'd be saving LOADS of time to buy these. geez! I am hosting a little give a way and would love to have you drop by. I am SOOO jumping on this band-wagon!! When I was looking at your blog and noticed that you were hand cutting your hex shapes, I was wondering, don't they have them already pre-cut? Probably the best $20 you've spent in a while, huh? Love your blog....was really interested in your hex piece along. great blogging about it!! Best money I've ever spent! I absolutely do not blame you! I have to say, it has made a world of difference for me. Also, I'm not the most accurate with scissors (how I made it through kindergarten is beyond me! ), so it makes my piecing much more accurate, too! It's not caving, it's being efficient! :) I need to order me some of those soon. I am loving your charm hexagon quilt. It's just beautiful so far.